go on the waiting list than receive a kidney transplant. Increases in deceased donation will never be enough to meet this need. Only by increasing living kidney donation can we save these patients. While there is no cure for end-stage kidney disease, a transplant is the best available treatment option. 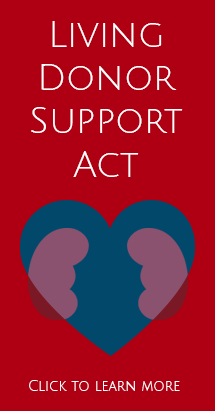 101, 622 Americans are on the kidney transplant waiting list as of April 22, 2015. On average, 3,000 people are added to the kidney wait list each month. We envision an America where no one dies because of a shortage of available kidney transplants; a world of transplant support where it is easy for patients to ask for a kidney and easy for donors to give; where donors are honored as public servants and never expect to be worse off for having saved the life of another.